I’m a huge advocate of social media and how it helps bridge new relationships and strengthen existing ones, but I think it’s bad practice to rely on it as a sole means of communicating with others. I’m a community manager today, but my background is in journalism. One of the first lessons I learned from the veteran journalists who were my mentors was the importance of meeting my sources face-to-face. This is because the human face and body reveal huge amounts of information that can’t be received over the telephone or email (social media wasn’t such a hot topic back then). Some information could be subtle, such as false confidence, while other cues could be blatantly obvious, such as a facial tick, shifting eyes or a bouncing knee that could reveal discomfort or even dishonesty. Even the layout of an office, clothing, personal hygiene and other such visual signals could bring more valuable information to a story. One study at UCLA indicated that up to 93 percent of communication effectiveness is determined through nonverbal cues. Another study (explained in the same article) said that the effectiveness of a performance was determined seven percent by words used, 38 percent by voice quality, and 55 percent by nonverbal communication. Nearly all of this information is lost in most social media communications. Some social mediums such as video and podcasts are attempting to break down these communications walls. However, the vast majority of the conversations about those pieces of content are conducted through written comments. Furthermore, video and audio can be edited in ways that make a person look and sound more professional, human and otherwise engaging (or the opposite, if that’s the intention). Skype and other video conferencing tools are probably the closest we have to face-to-face communications today, but still the positioning of a webcam can exclude valuable information about an individual, not to mention that you can’t judge a handshake over a screen. I’m not stating anything new here. It has been a long-standing best practice among networking business people to sit down for coffee with as many relevant people as possible each week and go to events and other meetups. 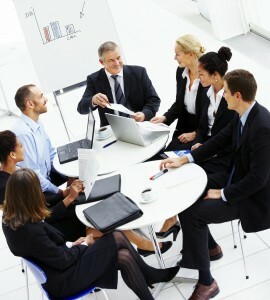 There have also been numerous studies on the value of face-to-face meetings for fostering strong business relationships. In-person events, for example, have proven to be helpful in capturing attention, inspiring positive emotions and building networks and relationships, as meeting face-to-face helps us remember each other and real-life events are usually longer social engagements than virtual ones. Negotiating important contracts (82 percent). Interviewing senior staff for key positions (81 percent). Understanding and listening to important customers (69 percent). So, what does all this have to do with developing a social media strategy for your business or client? My point is that, while a social media strategy should focus primarily on the online world, it should give some consideration to the potential opportunities that can come from marrying online and offline worlds. For example, Facebook has told us that photos and videos are the most important types of content because they encourage the most engagement. Why not make it a part of your social media strategy to attend and host real-life events where you can meet important people and take advantage of all the benefits that come from face-to-face communications. At the same time, take photos of the people you meet and upload them to Twitter via your mobile device, using the appropriate handles to extend the conversation there. You could also upload them to Facebook and encourage those people to find you, connect with you and tag themselves. You could also take video, and upload that content to YouTube, Vimeo and Facebook, where people who attended can engage with you further. Another idea is to create what we at Francis Moran and Associates like to call “web 2.0” business cards that list your social media profiles and pages. When you go to an event or meeting, hand out your social business card to people you have met in person to further develop those relationships online. I think you will find that those relationships will become stronger and more valuable than those you fostered solely online. What are you doing to marry online and offline social efforts? Share your ideas here. Social media is great for starting a conversation, but you are right. Ultimately that conversation needs to be taken offline for it to really go anywhere. A social media connection may turn into an email which then turns into a phone call which then turns into an in person meeting. The in person meeting is still crucial in business.